← Christmas Projects of Years Past! The staff at QuiltWoman.com have varied interests. Debbie, one of our talented graphics designer who puts together the patterns we sell, is a real animal lover. When this account of how she spent yesterday evening appeared in our in-boxes, how could we not post it? It has nothing to do with quilting and everything to do with goats. If you need a good chuckle, read on….. SO, armed with my barn boots, a flashlight, a previously landfill-bound water bottle now full of oil, and my dog Aspen, I headed BACK to the barn. By this time Amanda was out of the shower and talking again, a full moon had risen, and it was pitch black outside. Hence the flashlight. The water bottle of vegetable oil was highly recommended on many websites as a ‘bloat remedy’, and as for Aspen; well, as I mentioned before – pitch black, full moon, chupacabras in the woods, etc. So off I went. That done, the next step was to ‘firmly massage’ the goat’s sides. Again, not something wildly enjoyed by your average goat. The little ones still seemed like a good place to start, since I could prop their little front legs up on my knee and rub their sides, but I hadn’t counted on Hazel going all ‘rubber legged’ and sliding to the floor every time I started to squeeze. I had to keep stopping and hauling her back up to her hind feet, propping her front end up, and starting over. To my amazement though, it worked; in seconds I could hear deep, subterranean goat burps rumbling up her little throat. Success! After I figured I’d squeezed her enough – and she had slowed down to a few seconds between burps – I went after Charcoal. He didn’t slide to the ground; in fact, he tried to climb up on top of my head to get away from me, but since I wasn’t really enjoying the goat massage either I wasn’t sure I blamed him. But after a few minutes he too started belching. LOUDLY. Which seemed to really alarm Lavender, who hadn’t yet been squeezed, as he kept trying to break through the back wall of his stall to get out. 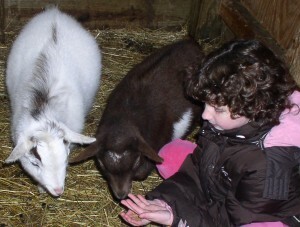 When I went for Lavender I realized I may have made a mistake in starting with the little goats first. Having just watched me squeezing the daylights out of his two companions, he was in no mood to let me anywhere near him. The closest I came to squeezing him was when I managed, once or twice, to pin him momentarily against a wall and lean on him, in the hopes that would have the same effect; but I’m not entirely sure it was successful. 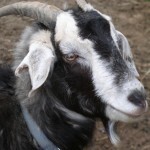 In the end, after chasing him in circles around the 8 foot by 8 foot stall for what seemed like an eternity, he began lowering his head at me, not a good sign coming from an angry adult semi-neutered male goat with two large, hard, pointy horns curling gracefully out of his skull. However somewhere in the melee he had begun to start burping on his own, so I hoped for the best and beat a cowardly retreat through the stall gate. So there you go, that was my evening of fun on the farm. I’ll find out in the morning if I was successful in treating their bloat; if not, apparently I will have a huge job ahead of me cleaning goat intestines out of the barn rafters. But, I’ll hope for the best. In the meantime, I’m just grateful I didn’t have to experience ‘goat farts’! This entry was posted in Fun! and tagged bloat, goat. Bookmark the permalink.